Taron Egerton and Jamie Foxx are inspiring the people with their new crusade in the final trailer for Robin Hood. Previous material has focused on a gritty retelling of the story, but the latest peek at the film shows off the humorous side as well, giving a well-rounded tease at what will be shown on the big screen when it hits theaters next month. However, it's not abundantly clear if the upcoming take on the Robin Hood story will be as funny as the new trailer makes it look or if it's just a new marketing strategy to get people who were on the fence into theaters. Either way, it certainly looks entertaining, no matter if it stays in the dark or goes the comical route. While the overall tone of Robin Hood isn't clear at this time, the chemistry between Taron Egerton as Robin Hood and Jamie Foxx's Little John is on full display. Ben Mendelsohn's Sheriff of Nottingham looks just as intimidating as you'd expect one of the actor's many villain roles to look. Even if the story of the film is lacking, the performances should be enough to carry the movie. 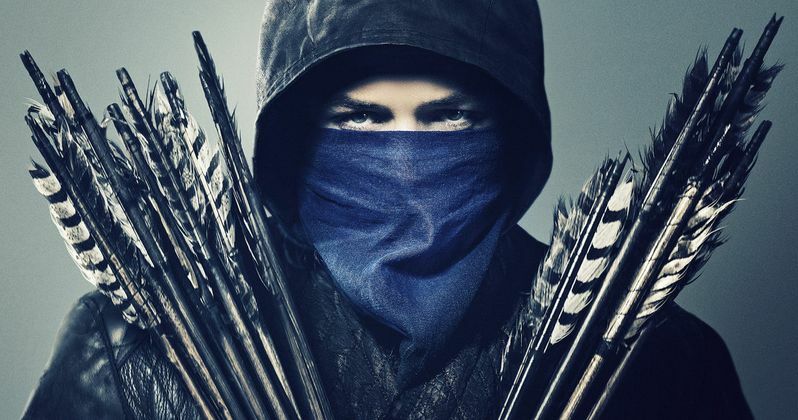 Robin Hood looks to be an edgier take on the often-told story, with plenty of action and a darker tone than what we've previously seen on the big screen. With that being said, it will be pretty interesting to see how the movie does at the box office after seeing Guy Ritchie's King Arthur: Legend of the Sword, which shares screenwriter Joby Harold, tank so hard at the box office. Obviously, both films are completely different, but they were both marketed the same, until the latest Robin Hood trailer was released, highlighting some of the humor and fun to the project, instead of the overly serious looks that we saw before. The upcoming Robin Hood movie is a "great ride with a current feel," according to Jamie Foxx. The actor is excited for the film and compares the horse chase action scenes to modern car chase scenes, which is evident in the trailer. Foxx enjoys the modern aspect of Robin Hood, and thinks that audiences will enjoy it as well. He had this to say. "The film brings you into this completely original world of Nottingham, and then it lets you loose to have fun in there!" In addition to Taron Egerton, Jamie Foxx, and Ben Mendelsohn, Robin Hood also stars Jamie Dornan as Will Scarlet, Eve Hewson as Maid Marion, Tim Minchin as Friar Tuck, and Paul Anderson as Guy of Gisborne. The movie was directed by Otto Bathurst from a screenplay by Joby Harold. The film is produced by Leonardo DiCaprio, Jennifer Davisson Killoran, Basil Iwanyk, Tory Tunnell and Harold. Robin Hood is set to hit theaters on November 21st, and you can check out the final trailer below, thanks to the Lionsgate Movies YouTube channel.